Study Bachelor of Physiotherapy (Honours) at the University of South Australia (UniSA). Information for International students. In addition, international students who speak English as a foreign language must have obtained one of the following standards within the last two years prior to admission. Possession of one or more of these qualifications, in addition to the academic entry requirements, does not, in itself, guarantee a place at the University of South Australia. Applications are considered on an individual basis and selection is competitive. Where previous study/work experience was conducted in English, the application must be accompanied by certified documentation from the educational institution/employer certifying that the language of instruction/employment was English. International applicants who already have physiotherapy qualifications should explore their options and eligibility for registration under The Australian Physiotherapy Council (APC) guidelines before they seek to apply for the Bachelor of Physiotherapy (Honours) program. Successful international applicants will be able to apply for credit for prior learning where the prior learning is deemed equivalent to the Bachelor of Physiotherapy (Honours) program. Benefit from over 40 years' experience in physiotherapy education. Experience first-hand what it’s like when you take part in real-world clinical placements as part of your study. Graduate with clinical experience when you learn in our on-campus Physiotherapy Clinics. Enjoy a rewarding career in the assessment, prevention and treatment of injuries and conditions. Undertake a research stream in methods and ethics, or a professional stream of advanced courses. Study a degree that is informed by our well above world-class research in Clinical Sciences1. Use your qualification as a pathway to further learning, including Masters by Research and doctoral studies. • This degree is accredited by the Australian Physiotherapy Council and satisfies the academic requirements for registration as a physiotherapist with the Physiotherapy Board of Australia. This degree prepares you for a rewarding career as a registered physiotherapist in the fast-growing physiotherapy industry, where you will be eligible to work as a first contact professional and valued member of allied health care teams. Your studies will develop your capability to assess, treat and prevent human movement disorders, enabling people to lead more functional lives. As part of your honours studies, you will also have the choice to undertake advanced research training, preparing you for further study or a career in research. You will learn from registered physiotherapists and above world-class researchers1, and experience first-hand what it’s like to work in clinical practice in our state-of-the-art Physiotherapy Clinics, located on-campus. Practical experience will be further highlighted when you complete real-world clinical placements. These field placements are a practical way for you to apply what you have learnt during your studies, and are a great way to build industry networks and relationships. All students enrolled in a program leading to professional registration must be registered with the relevant National Board. The registration process is undertaken by the Australian Health Practitioner Regulation Agency (AHPRA) with the University providing notification to AHPRA following enrolment in the program. Physiotherapists assess, treat and prevent human movement disorders across various areas of practice, including sport, musculoskeletal, cardiorespiratory and neurological conditions in people of all ages. During your first years of study you will focus on normal movement and basic medical science courses, such as human anatomy and physiology. The remainder of the degree focuses on abnormal movement and the prevention and treatment of disease and disability. You will be trained not only as a member of a healthcare team concerned with the physical and psychosocial rehabilitation of people who are ill or disabled, but also as a first-contact practitioner concerned with prevention and management of disability and illness in the workplace or community. professional practical experience at our on-campus Physiotherapy Clinic and during field placements. As an honours student you will also undertake advanced research training courses in research methods and ethics. 3. Students will be required to satisfy the standard of dress and behaviour prescribed by institutions in which the clinical placements are undertaken. Failure to satisfy such requirements may prevent them satisfying the requirements for the completion of the program. 4. Students must have a 'Provide First Aid' Certificate and a Cardiopulmonary Resuscitation (CPR) Certificate or equivalent before they will be allowed to commence the clinical section of the program. 5. Attendance requirements apply to the clinical components of the program. Students enrolled in courses with a clinical component will need to attend on a full-time basis for the duration of the clinics. 6. The program requires participation in practical classes where manual skills are practiced. Essential learning activities in some classes may require that students partially remove their clothing to a level that is appropriate to the learning activity. Students may also be asked to act as subjects for their peer group members. If a student is unable to meet these requirements they may be at risk of being unable to successfully complete course objectives and assessments and progress through the program. 7. Participation is required in practical classes and clinical placements where students are required to physically handle people including lifting and supporting people with disabilities. 1. Students are advised that they may be required to spend time in a placement outside Adelaide in a country or interstate location. 2. Students may be required to undertake fieldwork placement outside normal university teaching weeks. 3. Students are strongly encouraged to study full-time. Students seeking part-time study must discuss this with the Program Director prior to enrolment. Part-time students are normally expected to complete the program in eight years. 4. Normally students who achieve a credit level average in the courses which make up the first and second years of the program may be considered for the research stream. Normally a quota for places will apply. The invitation to students will be made at the commencement of the third year of the program. You will also complete a research project under the supervision of an experienced researcher; as part of this project you will complete a thesis and an oral presentation. This is a four-year, professional degree with honours. The honours component includes a minimum of one year of either a research stream or a professional stream. You will receive First Class, Second Class or Third Class Honours, depending on your performance. The research stream involves an Honours Thesis course, where you will undertake and complete a research project which may be either quantitative or qualitative. Specific training and education within appropriate approaches relevant to your research project will be developed through consultation, discussion, problem-solving and liaison with a group of experienced researchers. The professional stream includes a range of advanced courses where you will gain in-depth knowledge through the completion of industry projects. You will graduate with industry experience and connections, and a higher level qualification than a bachelor degree. Your honours year will prepare you well for a career in industry or research. Graduating with an honours degree will set you apart from the crowd, ensuring you have a competitive edge and are well-placed for a career in industry, research or further postgraduate study. When you study this degree at UniSA you will learn in our on-campus Physiotherapy Clinics. You will also take part in laboratory classes and gain further practical experience through clinical placements within a variety of metropolitan, rural, regional or overseas health settings. You will also benefit from the expertise of our above world-class researchers1, as well as that of practicing physiotherapists and award-winning academics. We’ve been teaching in this field for more than 40 years and are proud of the rich knowledge base we have created. You will benefit from our strong industry links when you complete clinical placements in a variety of metropolitan, rural, regional or overseas health settings. This offers you the opportunity to build important industry networks as you work alongside expert physiotherapists in hospitals, rehabilitation centres and community clinic and aged care organisations. During your final year you will complete a research project and thesis under the supervision of experienced researchers. This affiliation not only provides exceptional learning opportunities, but is also an important network opportunity. We also host regular University-wide employee master classes and employment expos, and alumni events in Australia and overseas. You may also choose to pursue a career in research – graduates with honours degrees are highly sought after by prospective employers, particularly within academia and research settings. The program is accredited by the Australian Physiotherapy Council and satisfies the academic requirements for registration as a physiotherapist with the Physiotherapy Board of Australia. Healthcare and social assistance in Australia is projected to make the largest contribution to employment growth (increasing by 250,200) nationwide1. Employment for physiotherapists in Australia is projected to increase by 16.7 per cent by November 20201. I have the privilege of directing a degree delivered by world-class researchers and educators who enable students to graduate ready to work autonomously to meet the needs of the community. I strive to create innovative and supportive learning environments that enable students to flourish and fulfil their potential. I always knew I wanted to be on my toes and work outside an office, which is why physiotherapy was a good fit for me. I also like the idea of working in the health industry and helping other people. Physiotherapy is a broad profession, with many different areas like sport injuries, rehabilitation, acute care and paediatrics. UniSA provides students with the opportunity to work onsite in the real world, through practical placements. This was the highlight of my degree, particularly working with Port Adelaide Football Club where I got to analyse injury data and assess the relationship with injuries. Every student faces their own unique struggles. I battled with an eating disorder before I could embark on my journey to becoming a physiotherapist. My goal is to help other people overcome their health challenges and improve their quality of life. Drawing on my personal experience, my ultimate wish is to start a foundation that supports teenagers struggling with eating disorders and related illnesses, empowering them to change their lives for the better. 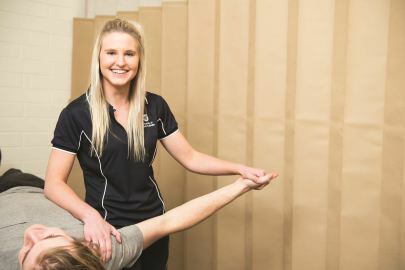 Bachelor of Physiotherapy student Danielle shares her experience of her rural placement at Sports Physiotherapy in Port Lincoln, supported by UniSA’s Department of Rural Health.